Homemade Sloppy Joes are so easy and so much better than the stuff you buy in a can! They are so easy, too You can have dinner on the table in less than 30 minutes! I haven’t made Homemade Sloppy Joes in decades. Last month I was trying to think of a sandwich that I hadn’t done in a long time. For some reason, Sloppy Joes came to mind! You can customize the flavor to your families liking. A little sweet, or sweeter. Trying to stay away from refined sugars? Honey is a great substitute because it gets all caramelized in the sauce. 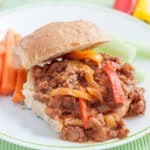 To make these sloppy joes, you just need to brown the beef with the onion and celery, then add the rest of the ingredients and let it simmer for a few minutes, until it’s hot. What could be easier than that? I hope you liked the post today for Sloppy Joes! Give them a try sometime. You won’t be disappointed! Homemade Sloppy Joes are so easy and delicious! You will wonder why you haven't been making them all along! Place beef in hot, heavy bottom pan with onions and celery. Breaking up beef as it browns. Once beef is browned and onions and celery and peppers, if using, have softened, add the remaining ingredients. Turn heat to medium and heat through. Can be simmered on low for a long time, if desired. Add water if sauce becomes too thick, and then cook some of the water out of it. This post may contain affiliate links, which means I get a small commission if you click the link and purchase something. See FTC Disclosure, here. « Slow Cooker Chili – 3 meats & 3 beans! This takes me back to my childhood! I know, right? When they made them for us they used the canned stuff! These are far superior! I love that you added in all the veggies to make it healthier. I bet the honey is a really nice addition- will have to try that next time we make sloppy joes! The veges give it a great texture and flavor profile, as well! Thanks, Katie! Sloppy joes are one of my favorite meals! What a twist, using the bell peppers! Sounds delicious, I’m absolutely trying these! They are so good! I am going to make them more often! Thanks, Kristine! I’d love to take a bite of these right now! They are pretty good, for sure! Thanks, Sarah! Sloppy joes aren’t really a thing in the UK but this looks so tasty, I’m gonna have to try it! They were huge in the states in the 1970’s! I think you’ll really like these ones, though! Thanks, Amy! I haven’t had sloppy joes in forever!! Yours look amazing! Thanks, Emily! I hadn’t had them in years myself!! Haha! I love tacos! He would not do well if he didn’t eat tacos! He might starve!! Thanks, Laura!